How do I transfer my album between computers? You'll first need to export the project, make the project available on the other machine, then use the import function. 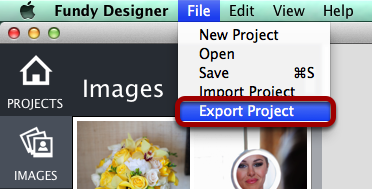 To export a Project, from the menu, choose File > Export Project. Select the location you would like to Export the project file and click Save. You can then move the project file to any location, such as a portable external drive. You can also use a file sharing service like AirDrop or WeTransfer to share the exported project file between computers. The great thing about your exported .fsd file is that Fundy Designer creates smaller proxy images from your original files when you import images into a Project. We do this for a couple reasons. First, it makes everything run extremely fast. Additionally, it makes your projects portable. Once your images are imported to a project, you can disconnect from the external drive or server and keep designing. You only need to reconnect to your original high-res images when you are ready to export. The Import feature is detailed below. 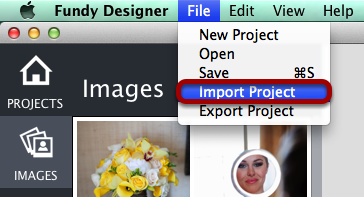 To import a project file that has been exported from Fundy Designer®, select File > Import Project. 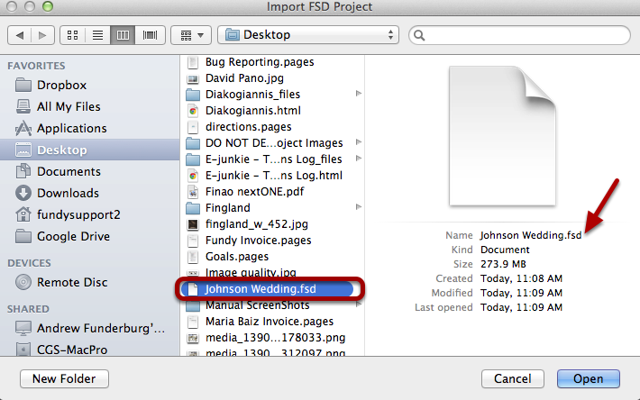 Navigate to the .fsd project file you want to import and click Open. NOTE: The project file must be in .fsd format. Additionally, you will need to have the original images for the project (and re-sync them) if you intend on exporting for Print or Proofer from the new machine.